Since 1981, when the Mitred Conure was listed on CITES Appendix II 158,149 individuals have been traded on the international market. P.m. mitratus: Both adults green in colour, with yellow on the underparts; brown/red forehead turning to brighter red on forecrown, lores, cheeks and sides of neck; ear coverts occasionally red; red feathers scattered variably on hindneck, mantle, throat, thighs and bend of wing; olive/green underwing coverts. Bill horn colour. Eye ring bare and buff/white. Eye dull yellow with grey inner ring. 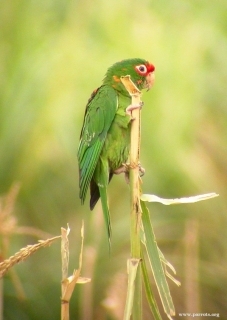 P.m. alticola: Both adults darker green than mitrata, particularly upperparts; red confined to thin frontal band and few scattered feathers on lores and sides of head; red on thighs absent. P.m. mitratus: Red on cheeks and sides of neck minimal or absent. Eye brown. Calls deep and harsh, as well as loud and abrupt notes. Some sounds are said to resemble a toy trumpet. Fruit such as: apple, pear, orange, cactus fruits, banana, pomegranate, forming about 30 percent of the diet; vegetables such as: carrot, celery, green beans and peas in the pod; green leaves such as: Swiss chard, lettuce, sowthistle, chickweed, dandelion; spray millet; small seed mix such as: millet, canary, and smaller amounts of oats, buckwheat, safflower and limited sunflower; sunflower soaked or sprouted; cooked beans and pulses, boiled maize and complete pellet. Avid bathers so provide overhead misters or shallow water bowls; also provide bird-safe chew toys such as: fir, willow, elder and pine branches; wood block toys, vegetable-tanned leather toys; puzzle and foraging toys, ladders, swings. Vertical box 12" x 12" x 18" (30.5cm x 30.5cm x 46cm). Race alticola may be rare. Possibly overall in decline. Has been traded internationally in large numbers. P.m. mitratus: Found in subtropical zone of E Andes in C Peru, south from Huanuco, through west-central Bolivia to NW Argentina, south to La Rioja and W Cordoba. Introduced to California, Florida and Hawaii, US. P.m. alticola: Temperate zone in Cuzuco region, C Peru. Found 1000-3500m (3280-11,480 ft). Alticola possibly seen up to 4000m (13,120 ft). Seen generally in dry subtropical zones but also recorded from temperate areas such as montane deciduous forest, cloud-forest, cultivated fields, grassy hills with tall herbaceous plants, brush and scrub areas with scattered trees and legume-rich savanna. May take cultivated crops, otherwise unknown. Seen in pairs or threes but may congregate up to 100 individuals outside of breeding season. May take cultivated crops, but generally feeds in natural forest areas. This species, as well as others, migrates to Lerma Valley in NW Argentina. 3 broad-oval eggs, 32.0 x 26.5mm (1.2 x 1 in).